Registered in 1997 (Q regd.) and it has done around 17.5K miles. Originally factory built and sold by Terry Nightingale as an ex-demonstrator to former WSCC Chairman Paul Edden, then one other owner before me. I bought the car in May 2014. Fitted with a CVH when it left the factory but converted to the 16v Redtop by the first owner (engine originally built by Ash Mason I think but fully rebuilt in my ownership). I have lots of paperwork, including the original build manual and for sale advert. The car was a regular competitor in the Speed series and hillclimbs until I bought it. I converted it back to ‘road’ spec (i.e. refitted the windscreen, wipers, interior trim etc.) and spent a small (or not so small) fortune getting it up to the standard I wanted. It’s only done one trackday at Knockhill in my ownership and plenty of road miles. Apart from the engine rebuild (£3k+ with receipts) and regular maintenance, it’s also had new rear shocks, disks and pads, new brake master cylinder, Willwood front calipers, alternator, inlet manifold (SBD), headlights, fuel filter and hoses, re-plumbed and simplified cooling system (no heater), new cooler running thermostat, new R1R’s, Simpson’s exhaust box, front ball joints, suspension set up and corner weighted. Basically, anything it’s needed has been done. MOT to December 2018 and next oil change also due December 2018. It's not an immaculate show car but is generally in very good clean condition, is reliable and has been maintained regardless of cost. It has all the right bits, IMO, and is equally suited to road or track use. 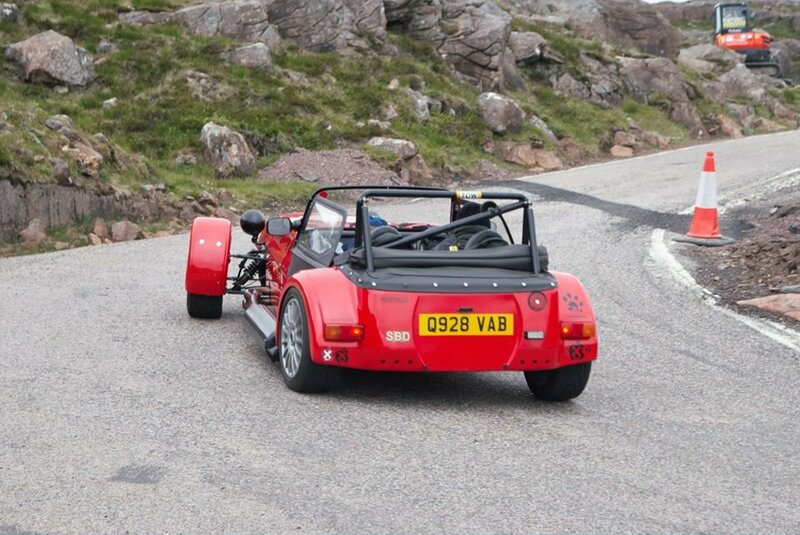 This is my third Westfield and I had never planned to sell it but times change. PM me for a chat or email to mattdotalexanderatvirgindotnet if you want more information or pictures etc. Fully rebuilt around 4000 miles ago. Early block with later head. Re-bored and decked block with new forged Omega pistons, re-bushed steel Carrillo rods, ARP big end bolts, reground crank, lightened flywheel and everything fully balanced, including clutch. New oil and water pumps. ~30psi oil pressure when hot at idle / ~60psi at revs. Rebuild stage 3 GM head with oilway mod (head was pressure tested and didn’t need it but was done as a precaution), skimmed, ported, new valve guides, new hydraulic followers and re-profiled cams (286deg/10mm lift). Standard valves. Head has water outlet if you wanted to add a heater. QED alloy shallow sump (with 6mm alloy plate sump guard) and it doesn’t leak! Re-packable 7” ceramic coated Simpsons non-cat silencer (or optional re-packable lightweight carbon Techcraft one). Both re-packed with Acoustafill last year. I can comfortably get 30mpg+ on a long run, 2-up with luggage and being (fairly) sensible. It idles smoothly around 1000rpm and pulls well in all gears. Sounds great with the Webers and big Simpsons exhaust. Alloy-cased Quaife Type 9 5 Speed straight cut gearbox with long 1st gear (~50mph). Short input shaft version. Cat Motorsport quick rack (1.5 turns) and wide-track front suspension with rose-jointed adjusters. Disc brakes all round. Front - Cross drilled and lightened with Willwood 4-pot calipers. Rear - new grooved disks, Sierra calipers & new pads. Adjustable brake bias from inside the cockpit. ‘Kit’ fixed-arch bodywork in original red gelcoat. Good condition for year with very slight crazing on O/S rear arch. Windscreen and earlier, stiffer doors (don’t flex like the later ones), WF half-hood with storage bag. Metro mirrors. Standard WF fuel tank with locking cap. I absolutely love the car and didn’t think I’d be doing this but I’m just not using it nearly as much as I’d like to for a number of reasons and it doesn’t make sense to leave it sitting in the garage. However, if it doesn’t go for the asking price, I’ll hang on to it. a sad day Matt , to anyone interested it really is a great car and you won't be disappointed. when are you getting the new one ????? Congrats. on the sale but sad to see it go. With 50 available in 1st and a 1.5 ratio steering rack the new owner will be alert from the get go. If I was feeling brave, I'd say you could just give me a lift. Car Details:White Seiw 2L Dunnell zetec with quaife box. Q928 Spotted at the Kelpies today - looking good! !